President Muhammadu Buhari has, Friday, taken the Peoples Democratic Party, PDP, to God, saying only God can punish the PDP for looting the nation’s treasury. 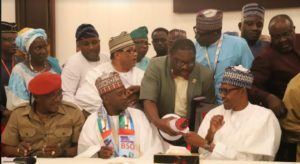 President Buhari made the statement when he received some members of his support groups at the presidential Villa, Abuja. He said the PDP abused the people’s trust on a large scale but assured that his government will get the looters prosecuted. President Buhari also said that his administration has confiscated looted properties and that he had ordered that the confiscated looted properties be sold while the funds generated would be used by the government. According to him, “Large scale abuse of trust, only God can give them punishment but those we can touch, we will get them prosecuted.